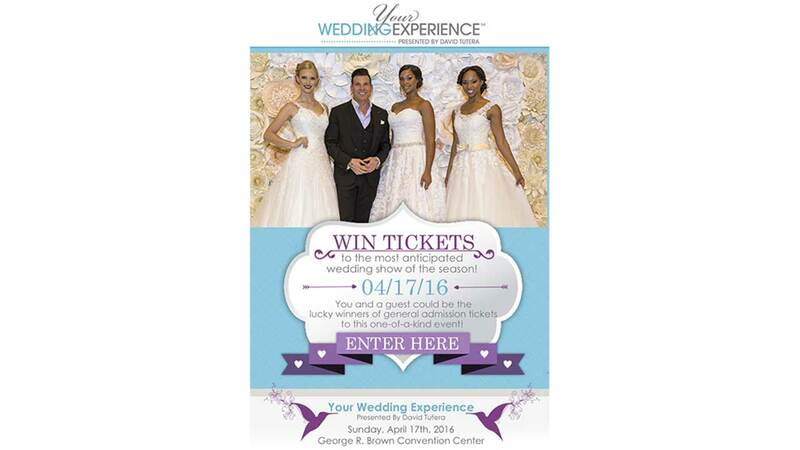 Your Wedding Experience Presented By David Tutera is coming to Houston! Looking for some wedding inspiration, reputable vendors, or just a place to get started? Planning your unique wedding day should be a fun and enjoyable experience that you can share with your family and friends. Meet 100 + wedding professionals approved by David Tutera who are committed to helping you plan your special day. Make connections, be inspired, collect ideas, and save time and money in the process - this is Your Wedding Experience. Buy Tickets! Decide what you want to get out of the event. i.e. inspiration, advice, book vendors, see the latest trends. Know your wedding date - if you're not sure, try to have a few dates in mind. Bring your calendar and know your availability so you can schedule appointments. Get ready for inspiration because it's coming your way! Access to Spectacular VIP Only Prizes!